The annual Darwin Day is here. We invited journalist and author, Chip Walter, to give a talk on human evolution and its importance to us today. We are also receiving the University Award for Philosophical Diversity from the American Humanist Association. Pizza, cupcakes and drinks will be served. 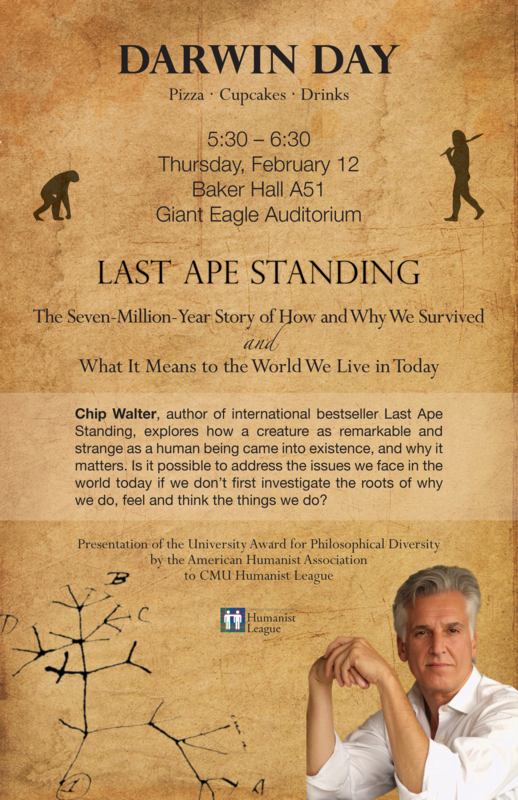 Chip Walter, author of international bestseller Last Ape Standing, explores how a creature as remarkable and strange as a human being came into existence, and why it matters. Is it possible to address the issues we face in the world today if we don’t first investigate the roots of why we do, feel and think the things we do?